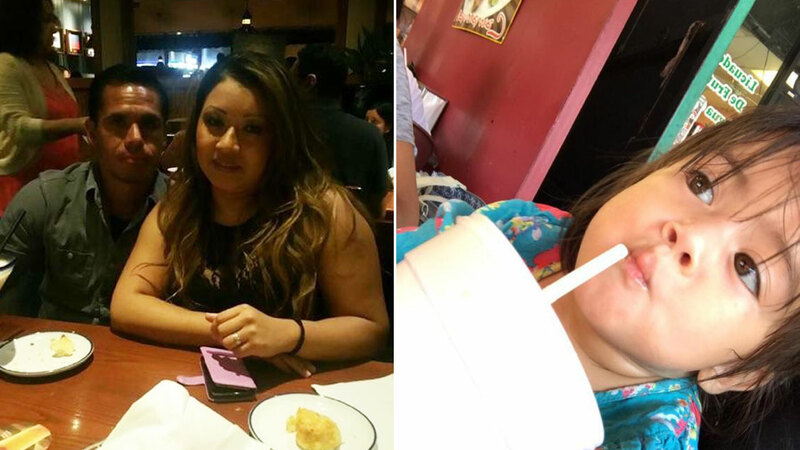 Undated photos of 34-year-old Ruth N. Chinchilla and her 2-year-old daughter, whom she saved from a suspected drunk driver that crashed in North Hills on Sunday, Nov. 27, 2017. NORTH HILLS, LOS ANGELES (WPVI) -- A mother is dead and a child is in the hospital after they were struck by a suspected drunk driver Sunday night, according to Los Angeles police. The crash occurred just after 10 p.m. in the 8800 block of Woodley Avenue. KABC-TV reports, the victim and her toddler were believed to be right in front of their home when the driver, traveling in a 1997 Chevrolet pickup truck, crashed into seven parked cars and struck them. Police said the victim, Ruth Chinchilla, was standing in the bike lane of the road as she was getting her 2-year-old daughter out of a car seat in the back of her car. The 34-year-old woman was struck and pronounced dead at the scene. Her 2-year-old daughter was transported to a nearby hospital and is expected to survive. "We believe faster than the 40 mph speed limit impacted the mother and launched her 30 feet forward. The toddler was launched approximately 60 feet, and they both landed on the roadway," said Detective Bill Bustos of the LAPD. Family members were at the scene at the time of the crash. A cousin of the victim said Chinchilla tried to push her daughter out of the way when the suspected DUI driver came toward them. Relatives of Chinchilla stopped by the home Monday morning to see the crash for themselves, many of them overwhelmed with grief. Compounding the tragedy, investigators said the driver, 22-year-old Jose Macias, was driving under the influence when the crash occurred. Chinchilla was a mother of three, including a 16-year-old son and a newborn son. Her cousin, Abel Ibanez, said Chinchilla's husband had already taken in the two boys when she was getting their daughter out of the car. Ibanez said the news that the suspected drunk driver was arrested won't do anything to ease their devastation. "She's gone. She's not going to come back. It hurts a lot for us, but good that he does get charged so he won't do something to another family," he said. Macias was arrested and booked for 2nd-degree murder.